Based in the Democratic Republic of Congo (DRC). 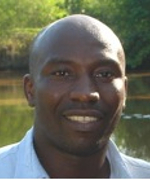 Dominique is a founding member and Executive Director of Strong Roots Congo, a conservation and sustainable development NGO based in Democratic Republic of Congo (Strong Roots Congo is a Member of the ICCA Consortium). For twenty years, Dominique has worked to design and oversee conservation and sustainable development initiatives that aim to balance the needs of humans with those of forests and wildlife. A primary goal in his work is to integrate the knowledge of local communities and indigenous peoples into effectively conserved areas (whether officially protected or not). National and international organizations within and outside of the DRC have enlisted Dominique’s professional experience as an independent consultant. Dominique has written and co-authored articles, chapters, and teaching materials on topics related to the relationship between local communities and indigenous peoples and conserved areas, the preservation of great apes, and natural resources governance and management in general.